Though the athletes are a crucial part in determining a crew team’s success, the boat is equally as important. A skilled oarsman or woman needs to become one with the boat and understand how it moves. "Looked at one way, a racing shell is a machine with a narrowly defined purpose: to enable a number of large men or women to propel themselves over an expanse of water as quickly and efficiently as possible," says Daniel James Brown, author of The Boys in the Boat. "Looked at another way, it is a work of art, an expression of the human spirit with its unbounded hunger for the ideal, for beauty, for purity, for grace." 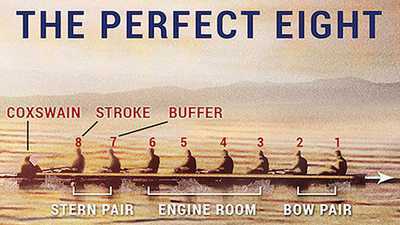 In rowing there are four primary types of shells used: the sculling outrigger, the pair-oared outrigger, the four-oared outrigger, and the eight-oared outrigger. An outrigger is a set of rowlocks that sits on a frame sticking outward from the upper edge of the shell. Harry Clasper, a prominent English rower and boat builder, first used outriggers in the 1840s. The first racing shells, known as Lapstrake, or clinker boats, had hulls made from overlapping wooden planks called strakes. The hull is the shell frame, or main body, of the boat. Since the sport is largely based on speed and swiftness, boat builders started looking for ways to eliminate weight and streamline the design of shells. In the late 1800s, boat builders looked to composite materials as a new way to improve racing shell design. The first composite shells were made in 1867 from a form of papier-mâché composed of layers of paper saturated with a varnish or glue, which hardened once they were dry. Geo A. Waters and his father Elisha were the first to construct these paper boats in their box factory in Troy, New York. These new shells were light yet rigid and could be used in various climates. As the use of paper boats in racing and pleasure boating became more commonplace, the demand for them increased. However this demand was short-lived and never left the United States. The design of the paper boat was patented and expensive to make since the paper needed to be refurbished frequently as the boat would weaken or crack if it absorbed moisture. With a need for light yet durable shells, builders began using thin spruce and cedar. Starting from a delicate wooden framework, strips of wood were nailed to the frame to make the hull, requiring thousands of brass nails and screws that fit all of the wood in place. The heads of these nails were then filed down and the exterior of the shell was then coated in multiple layers of marine varnish. An extensive process, the smallest mistake or careless move could ruin days, even weeks of work. In the early 1900s racing shells were primarily crafted from Spanish cedar, the same material used for cigar boxes. In 1927 George Pocock, the renowned boat builder who crafted shells for rowing teams across the country out of his workshop at the University of Washington, forever changed American shell craftsmanship when he began to use native Western red cedar instead of the expensive, imported Spanish cedar. Inspired by the old Native American canoes of the Puget Sound, Pocock discovered that Western red cedar had a wide variety of qualities that made it perfect for racing shells; its low density made the wood easy to shape but its tight grain made it strong and flexible. Pocock’s red cedar shells were light and buoyant with friction-free bottoms. They were elegant and yet durable enough to withstand rough conditions. New scientific innovations following World War II once again changed the craftsmanship and production of racing shells. Builders began experimenting with fiberglass, painting a fine weave of it with hard resin over the outsides of varnished cedar. The fiberglass reduced the possibility of leakage when hitting debris or other boats. 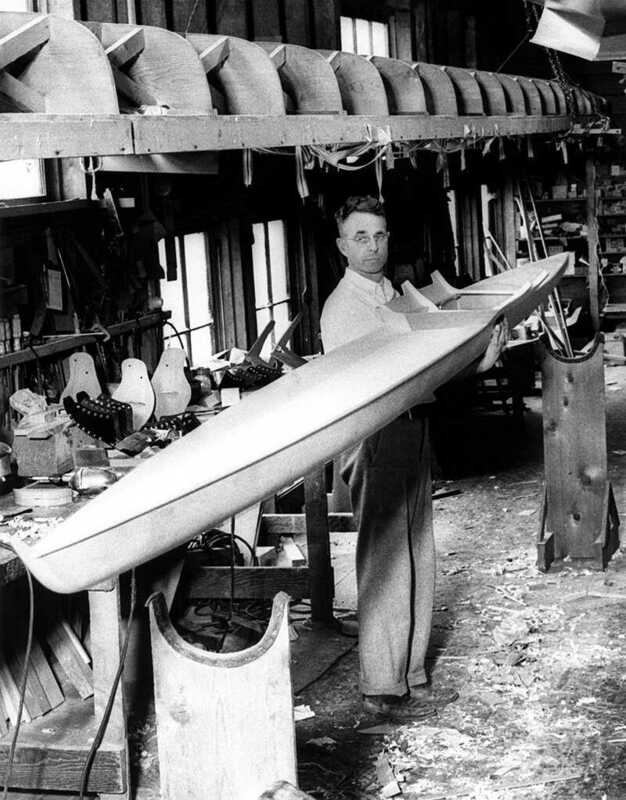 In 1961, George Pocock’s son Stan built the first fiberglass rowing boat called a wherry. Though the wooden shells of George Pocock’s time are still well-loved classics, most standard shells are now built from reinforced plastics or carbon fiber. George Pocock once stated, "A good shell has to have life and resiliency to get in harmony with the swing of the crew." Although their materials and designs have changed over time, the building of racing shells remains a cherished trade. The industry has expanded from pioneers like Pocock to include hundreds of different companies and brands. Modern day boat builders continue to innovate, trying new materials and methods to help carry rowing teams to victory. 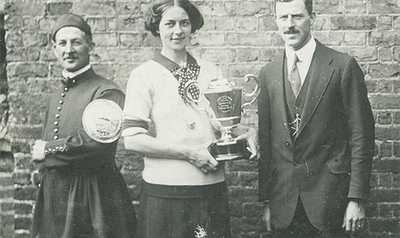 Rowing is a sport where no individuals are crowned the MVP. See the seat assignments of the eight boys who won gold in 1936.